It took me a couple of weeks to get around to checking if the Japanese step-down transformer Akira’s mother had sent me would work on my sewing machine after it arrived from the States last month…and then until this week for the postie to finally get through the snow to deliver the replacement transformer we ordered when we found the fittings were incompatible on the Japanese gadget. And it was not until this weekend that our wonderful long table made it into the house – it is such a great workspace, I have been longing for it for weeks! 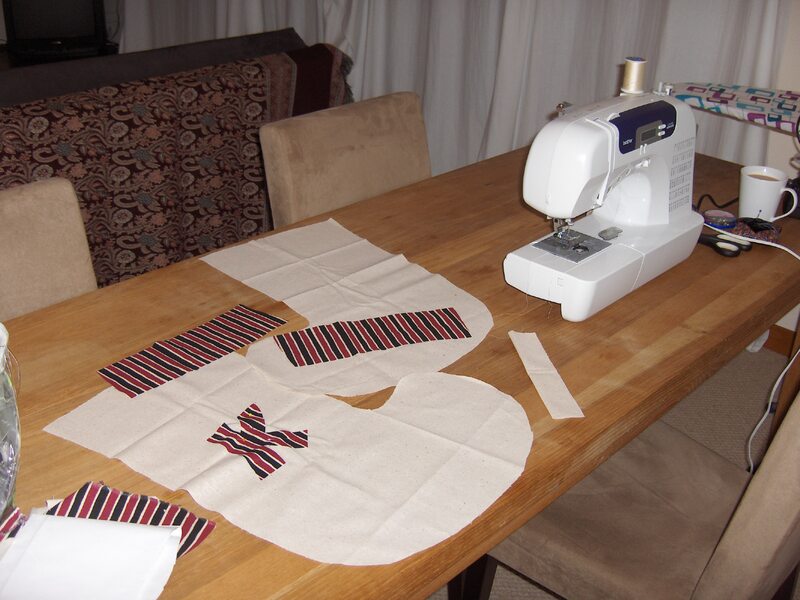 So it was with some joy (and a little trepidation) that I set up to finally sew Kazuo’s first Christmas Stocking. We have been reading numerous books lately that make reference to bulging stockings at Christmas time…and though the Christmas festival still has little point of reference for him, Kaz seems happy about the prospect of hanging up a stocking. Although there are lots of lovely tutorials and patterns on the net, our printer is out of ink…so I just decided to draft my own. Thus, like all my cobbled together projects, I do not have a pattern to offer you, and a few errors of construction were made along the way…and if I were to do this again I know what I would do to improve the output…but my non-sewing family members are happy, so I think it turned out well enough to share with y’all. I used some leftover beige linen for the sock and some stripey fabric I used when constructing fabric items for Kazuo’s nursery for the trim. First, I cut two pieces of trim and a strip to make a loop for hanging. I ironed down a small turnover on the shortest sides of the trims and sewed up the strip, folded it out and ironed it ready to insert in the top seam. 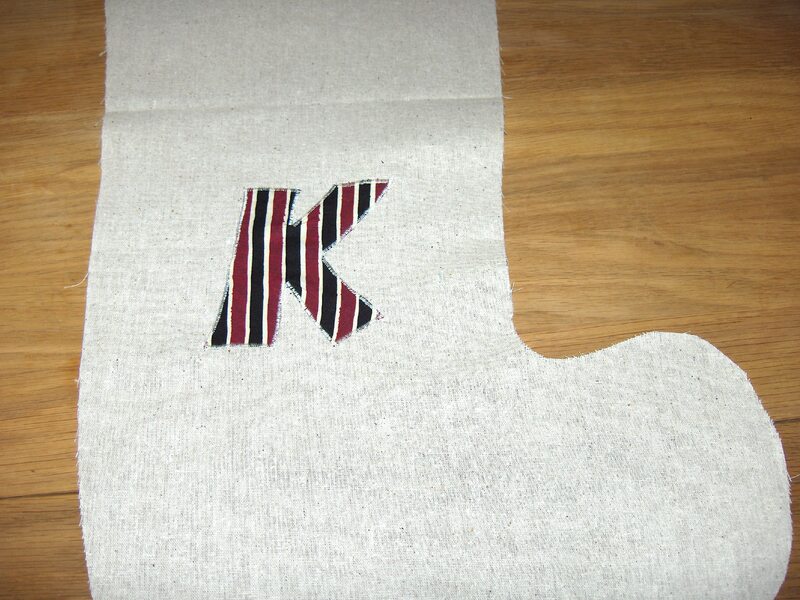 Then I appliqued a freehand ‘K’ onto the front of the stocking using the stripes. 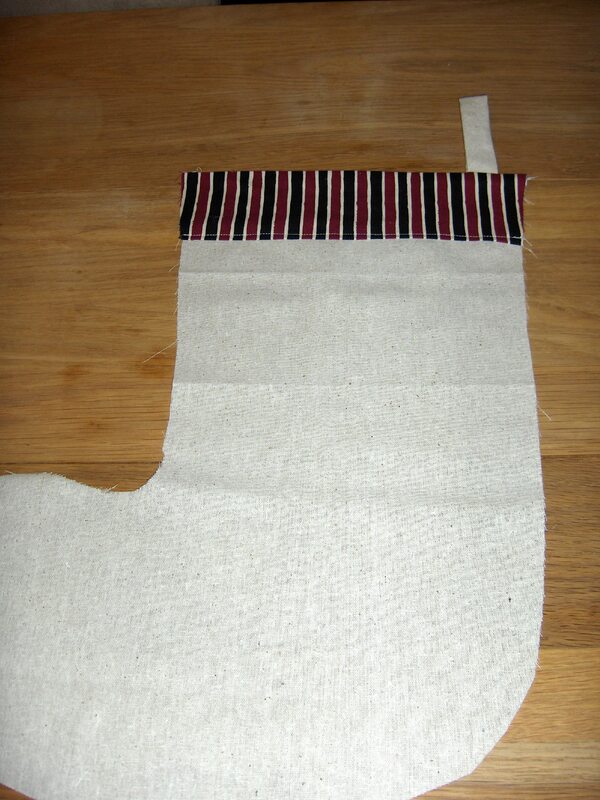 Next I sewed the trims onto the top of the stocking, with RIGHT side of the stripes against the WRONG side of the linen stocking. As you can see from the seam ripper and thread pile…I got this wrong the first time – the instinct to sew right side to right side is so ingrained! 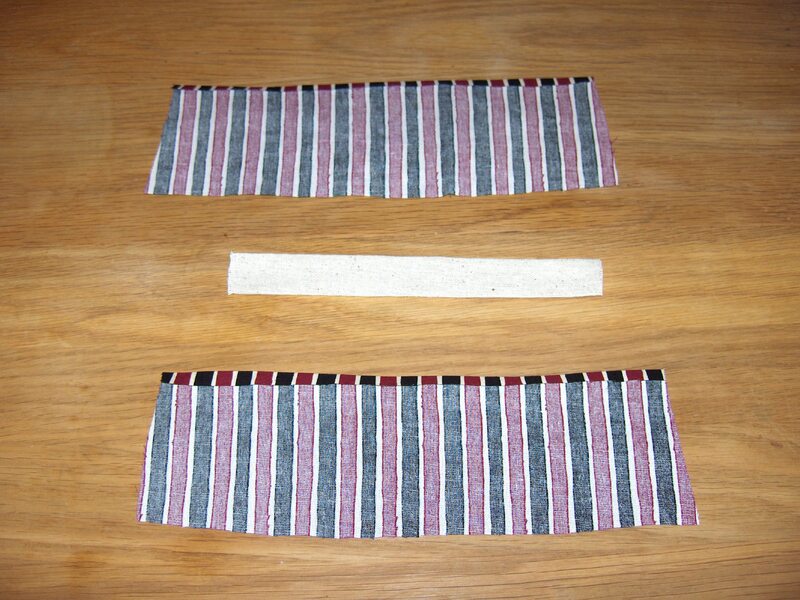 When sewing on the back trim, insert the loop – folded in half, with the edges flush with the outer seam edge – into the seam so that it is attached when you turn out the seam. Then topstich down the ironed edge of the trim. Finally, with RIGHT side to RIGHT side, sew around the outer edge of the stocking, matching trims at the top and (hopefully) bottom edges. 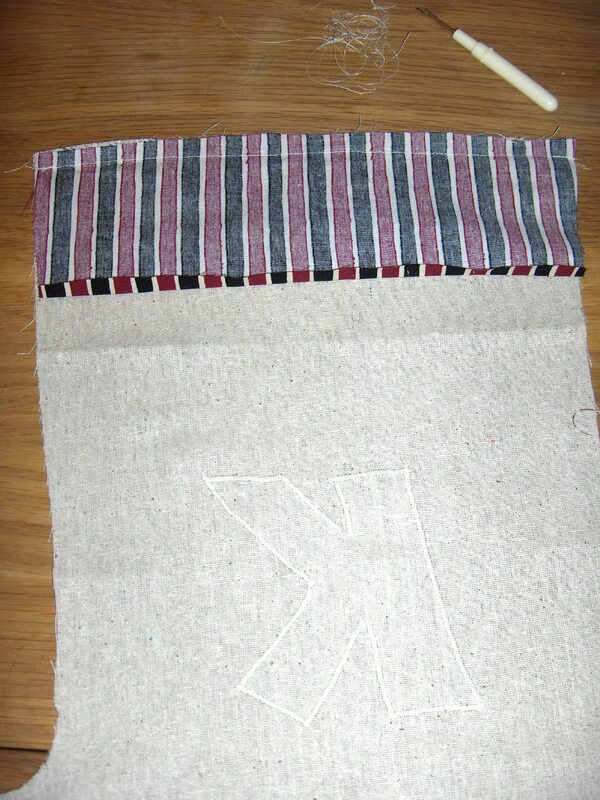 Zig-zag/overlock this seam and then trim corners before turning out. I am looking forward to hooking this up for the wee one in a couple of weeks and filling it with a few treasures so that he has a Christmas surprise. Now I just need to turn my mind to other Christmassy things…the weather and the relocation have both really slowed down my holiday preparations this year, we are still unsure if we are going to be able to source a tree…but I am determined to use the next couple of weeks to come up with some festive ideas as we begin to build our own family holiday traditions. All ideas gratefully received!